Not the kind that sing in cartoons. The real, living animals. They’re pretty cute. 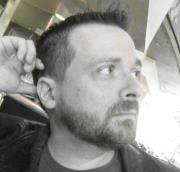 For those who’ve never seen one before, I’ve included a visual aid. Now look at that little guy (or gal). Very cute, right? Chipmunks hang out around my house. Other than getting the cats all fired up through the glass, they aren’t a nuisance. I was standing outside when one of these cute things scurried right past me. It stopped in the road, not too far from where I was standing, and looked up at me. I approached slowly, as I often do with wild animals that don’t look capable of making a lunch out of me. To my amazement, it didn’t run. It just…looked at me. I studied the animal for a few minutes, admiring its beautiful markings. I didn’t try to touch it. It didn’t try to touch me. We just looked at each other. Man and nature. No fear. Just good old curiosity. Satisfied with my “nature moment,” I stepped away from the animal and started back towards the house. When I got to the door I turned around. The chipmunk was still there, and it was still looking at me. Did it want some food? Had it known other friendly humans that fed it? No sooner had I started pondering those questions, a car rounded the bend, heading for my new little friend. Right under the tire of the car. Alive and curious one second. A flat and dead and bloody mess the next. All I could do was whisper, “Goodbye, chipmunk.” Then I walked into the house and made a nice lunch. But I haven’t stopped thinking about that strange moment. Maybe it means something. Maybe not. I'll let you be the judge. 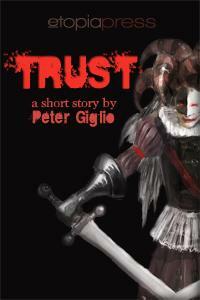 You can buy Peter's short story, Trust,as a standalone Here and find out more about him on his Website. Awwww, okay, that was just sad. I can write about anything scary and heart-wrenching, but, OMG, the little guy was so fixated on his new friend that it was the end of him. Geeze, go for the heart strings. ;^) What is it about sweet animals that have that affect on us? Aw, sad. 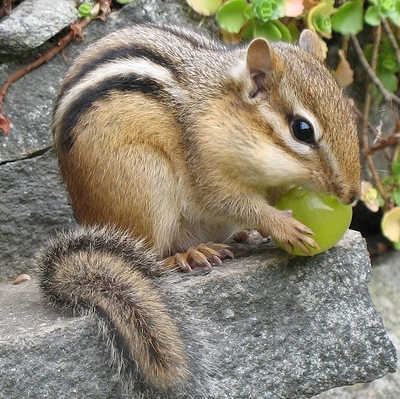 Chipmunks are gorgeous.